How Sophie and Bouchra started New York's chicest jewelry brand. 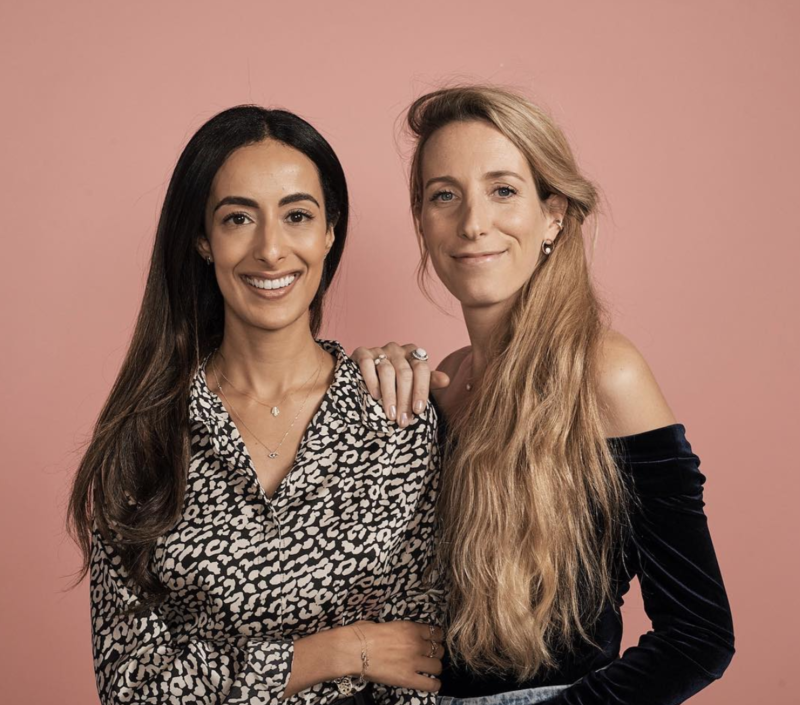 Hailing from the Netherlands and Morocco, Sophie and Bouchra are the two female founders behind New York City’s trendiest jewelry brand made from real gold – AURate. Sophie and Bouchra met in 2010 when they were studying at Princeton. Little they did know that four years later, they would become business partners to start New York City’s chicest jewelry brand – AURate. While Sophie and Bouchra enjoyed their corporate jobs at BCG, Marc Jacobs, and Goldman Sachs, they were seeking something more. As two entrepreneurial spirits, they longed to put their judgement and creativity to use. That’s when they decided to build AURate: an iconic brand of their own. 1. What does AURate stand for? AU = The chemical element gold: All of our products are made with real gold. Rate = Quality: We make sure our products are of the highest quality. AURate = Orate: When you put “AU” and “Rate” together, you get “AURate”, which sounds like the word “orate”. To orate is to tell stories, and for us, we want to tell stories through our jewelry. Every woman has her own story, and we are here to tell it. We are a brand built for women and by women. Bouchra Ezzahraoui (Left): Went to grad school at Princeton; worked at Goldman Sachs before starting AURate. Sophie Kahn (Right): Went to school at Princeton; worked at BCG and Marc Jacobs before starting AURate. 2. Did you always know you want to be an entrepreneur or did you foster that entrepreneurial spirit along the way? Sophie: I always wanted to do something big with my life. I wanted to build things, see things, and explore new things. I’m never satisfied with the status quo. I like to push myself and see where I go. That’s why I came to Princeton from the Netherlands in the first place. My grandfather was an entrepreneur, but my parents were both doctors. It took me a while before I started taking all these risks because I didn’t grow up in a particularly entrepreneurial environment. Bouchra: I come from a family of entrepreneurs, so I know very well what entrepreneurship entails. However, out of college, I wanted nothing but to work in a structured, corporate environment so that I could equip myself with all the skills I would need down the line. However, I always knew that I will start my company one day, whether that’s 5, 7, or 10 years down the line. 3. Both of you were in the corporate world before AURate, working at BCG and Goldman Sachs respectively. What did you gain from your experience? Sophie: For me, BCG was a super good learning ground. You learn the basic toolkit to analyze any problems that come your way, from Excel to Powerpoint. No matter what client or industry it be, BCG gave me the tools and framework to answer any questions for my client. What I was missing, though, was the space to be really creative and innovative. I like making decisions, but there was not much freedom to make decisions as a consultant – my job was to give advice. Bouchra: In college, I was a math major. I became a trader at Goldman, and I was managing and looking at risks all the time. For me, that was really interesting because it the risky environment is similar to what an entrepreneur has to go through. My time at Goldman made me tougher. It also fostered my entrepreneurial skills. I was there for close to 7 years: I got to hire, nurture and build teams. That risk-taking culture and environment is easily transferable to a startup because when you are building a start-up, you are constantly weighing the risks between different options. 4. For Sophie: How did you leave BCG to work for Marc Jacobs, before starting AURate? Sophie: My mentor at BCG was working with Marc Jacobs, and he made that connection for me. I wasn’t part of the Marc Jacobs case, so I had to take a lot of extra initiative to get on the team. I told my mentor that I really liked his project, and I would knock on his door everyday to ask, “Can I please help with your project?” I worked extra hours at nights and on weekends as well. Instead of waiting to potentially be on the project, it’s important to make it happen yourself. You can’t wait for the project to come to you. 5. A lot of college students today are choose to work in finance or consulting for a few years before starting their own companies. Would you recommend that path? Sophie: Honestly, yes, I would. Obviously, there are people like Mark Zuckerberg who clearly knew what they wanted, dropped out and started their own companies. If you are one of them, great. But for student who are not sure what they want to do and still want to learn, it is a very valuable experience. It doesn’t have to be finance or consulting, it can be joining a startup too. For me, I gained a background in consulting with BCG and a fashion background from Marc Jacobs, but what I wish I had was the experience of working in a startup. If I was 18 again, I would do a year or two in consulting and a year or two with a startup, before starting my own company. 6. How did the idea of AURate come about? Sophie: So I was actually having with my good friend and co-founder Bouchra, and she saw the green mark left on my finger from an overpriced ring I had purchased. It was not even made from real gold. We started saying how we couldn’t afford real gold, and even if we did, the styles were outdated. There’s no brand out there that is ethical, stylish, and affordable. So we started taking design classes at Parsons ourselves, and until today I still design all the pieces myself. My friends liked our pieces, and from there we started growing organically. 7. What were the most difficult parts of scaling the company up? I think it’s the team. It’s difficult to convince really talented people to leave their jobs for this risky idea we have. Even today, we are constantly trying to find talent that is a good fit for us. Fundraising is also challenging. Unlike at BCG and Marc Jacobs where daily life was more or less structured, each day at AURate is a new adventure. Often times, you know what you need to do, but what you end up doing is different from what you have in mind. It’s insane and non-stop all the time. 8. Every company has its challenge – what is the biggest challenge that AURate is facing? We’ve been growing at 400% a year and have seen strong growth. The question now is to continue to grow our company in a sustainable way. At first, the team is very small. But as we scale, a lot of new staff come in, and we need to make sure everyone is on the sage page to ensure our customers get the best experience. 9. How big are you hoping to grow your company? In terms of size, we want to be the next Tiffany. We will be a modern star: specifically tailoring the modern, millennial women. 10. What’s one piece of advice that you would give to your 18-year-old self? Sophie: Believe that you can do what you love. It took me a while to have the confidence to believe that I can do what I love. A lot of people are insecure overachievers: they stay in jobs that do not necessarily fulfill them and continue to do work that they are not truly passionate about. Think about what you really want to do, and try it. Worst case scenario is that you fail and go back to your corporate life. You only have one life, and you should do what makes you happy. Bouchra: Never say never. Don’t wait until everything is perfect – if it feels right, just do it. If you will regret not taking that risk, do it. It’s also important to take justified, calculated risks. Alexandra Huang is a first year at Northwestern University. Her favorite hobbies include taste testing at different restaurants, learning Japanese, vlogging, and writing articles. Her website is alexandrayh.com.